We’ve lost too many musical icons over the past few years and this new aerobics music pays tribute to 3 special icons. Micheal Jackson, Whitney Houston and Prince are celebrated in fine fashion with all the hits your classes know by heart! There’s plenty of energy and memories to go around. From “Bad” and “Beat It” to “Every Woman” and “Kiss”…They’re all right here! 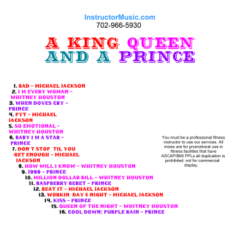 We also included a Purple Rain cool down track at the end. Salute!